Dan Leo is one of my favorites. I just love these thick black lines! Unfortunately, I have lost his pictures in an accident, but you can visit his Facebook page. 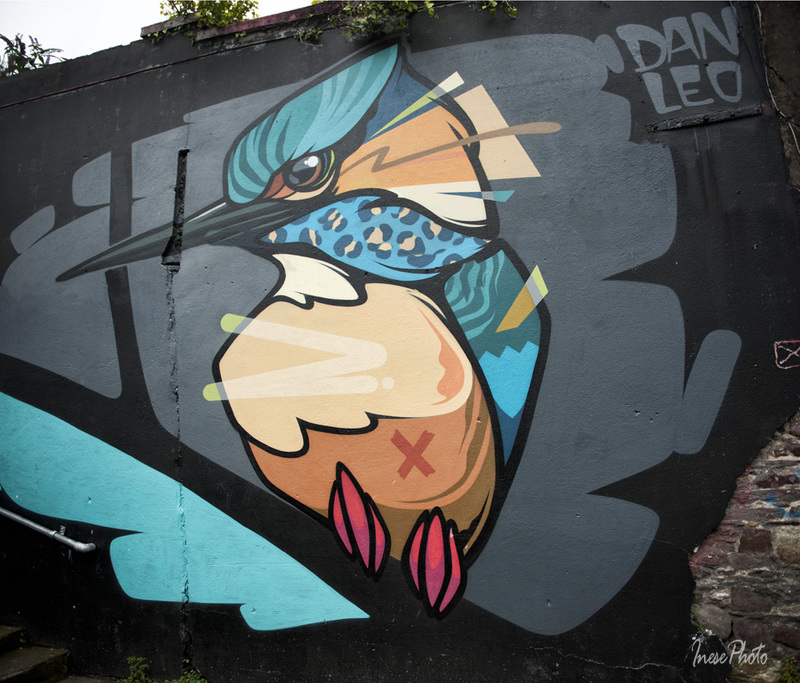 Dan Leo was born in London and moved to Ireland in his youth. To see more details, you may want to enlarge the pictures by clicking on them. More birds 🙂 Another favorite from Toronto, Canada. BirdO! You can follow him on Instagram. 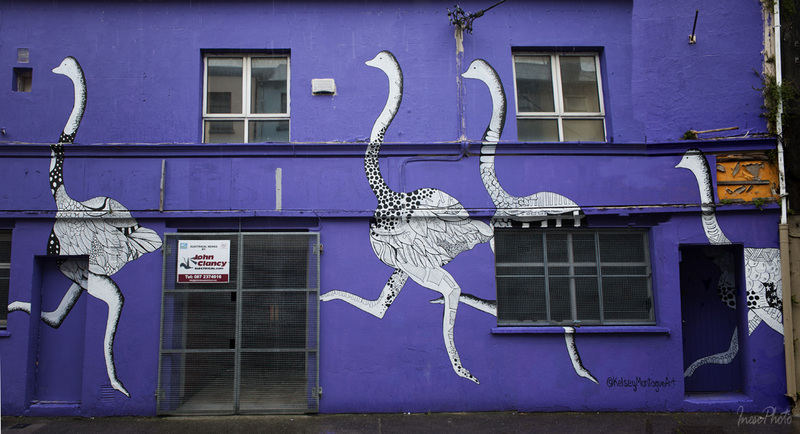 It is BirdO‘s second time in Waterford, and I am proud that Waterford Walls festival is bringing artists of this caliber to our city. Just around the corner – Magdalena Karol, Poland. Her girl with the bird house backpack reminds me of Dr. Jack Vallentyne, AKA Johnny Biosphere, whom I met in the 1980s. Kelsey Montague, also from the USA. I love her works, especially the Wings anyone can step into. 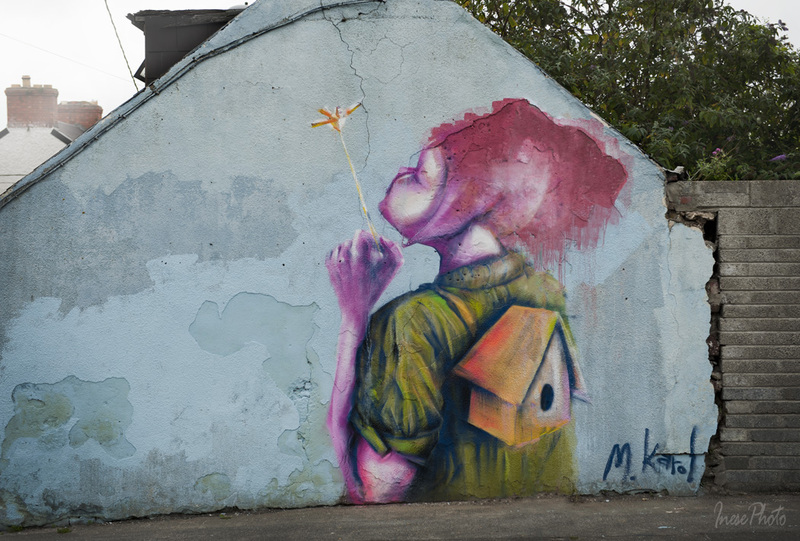 Hope she will paint a pair of wings for Waterford some day. More in O’Connell street. 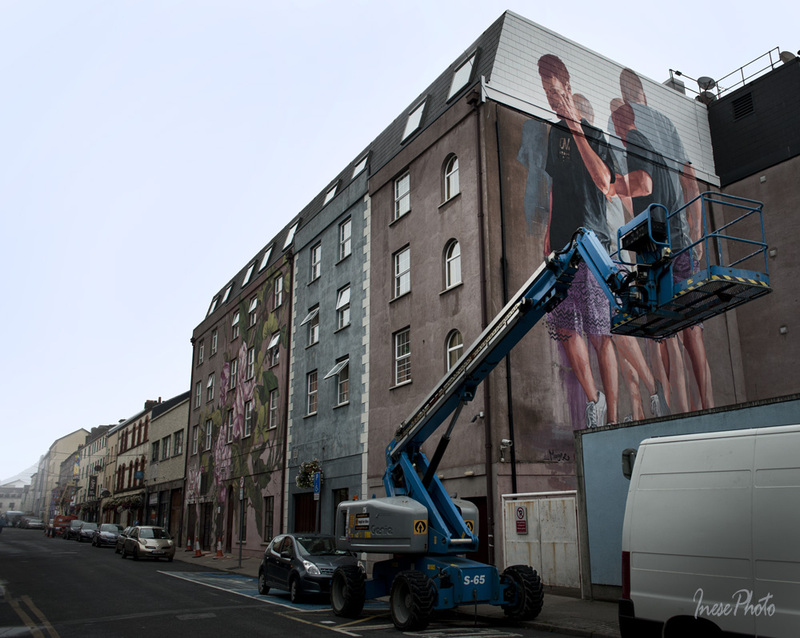 Australian artist Fintan Magee known for his stunning large-scale murals is working on the highest wall available in Waterford 🙂 It is so cool to have his work in our city. 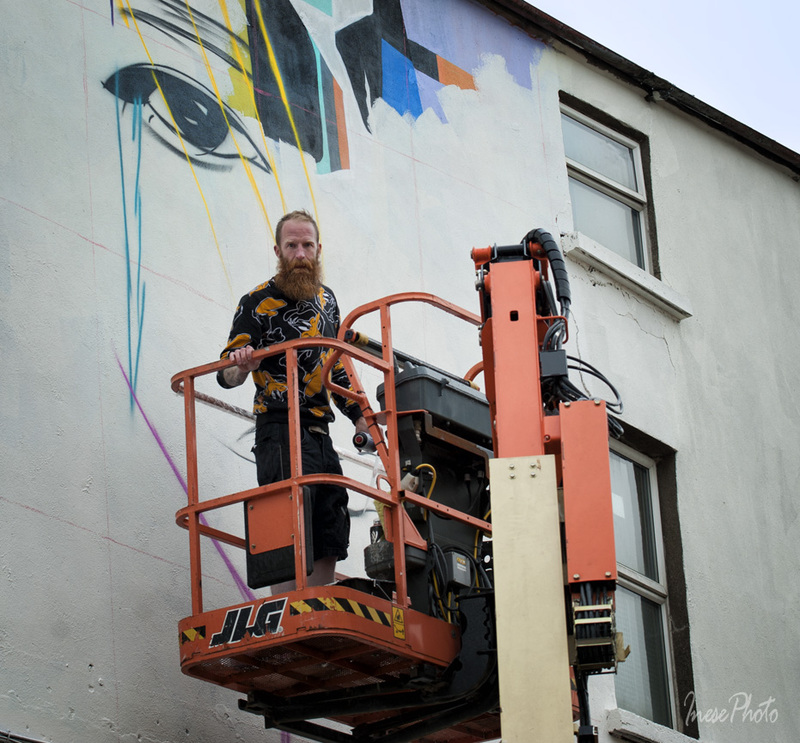 Amazing constellation of street artists at Waterford Walls this summer. DMC – Dermot McConaghy from Belfast- is back with another beautiful female image. 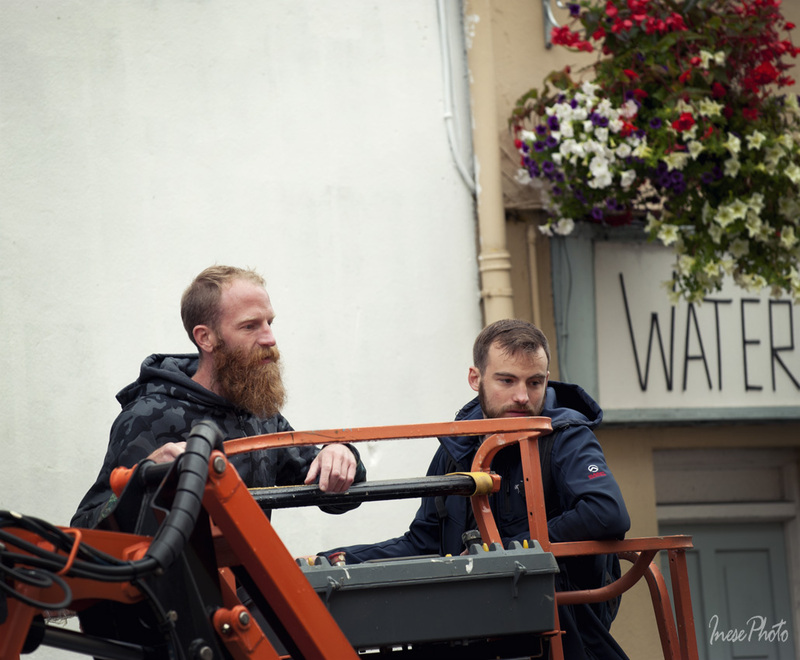 Dermot and local photographer Patrick Lyons. 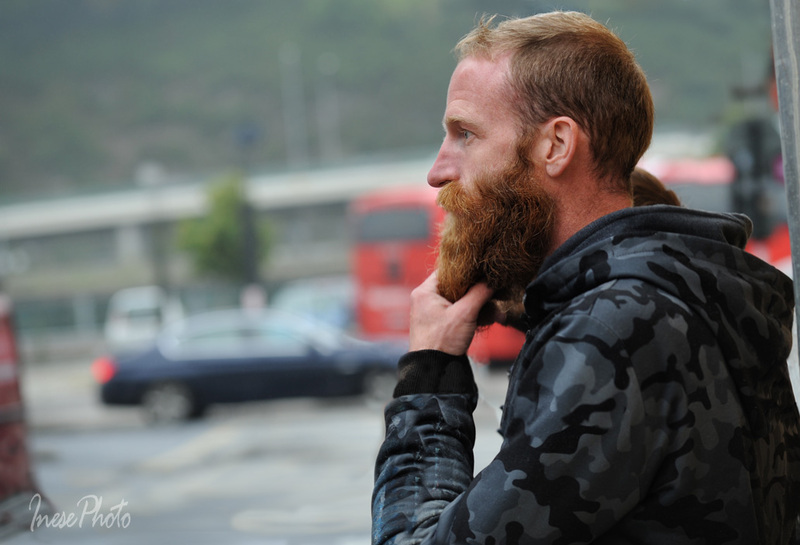 Jess Tobin AKA NOVICE, from Dublin, is working in George’s street. 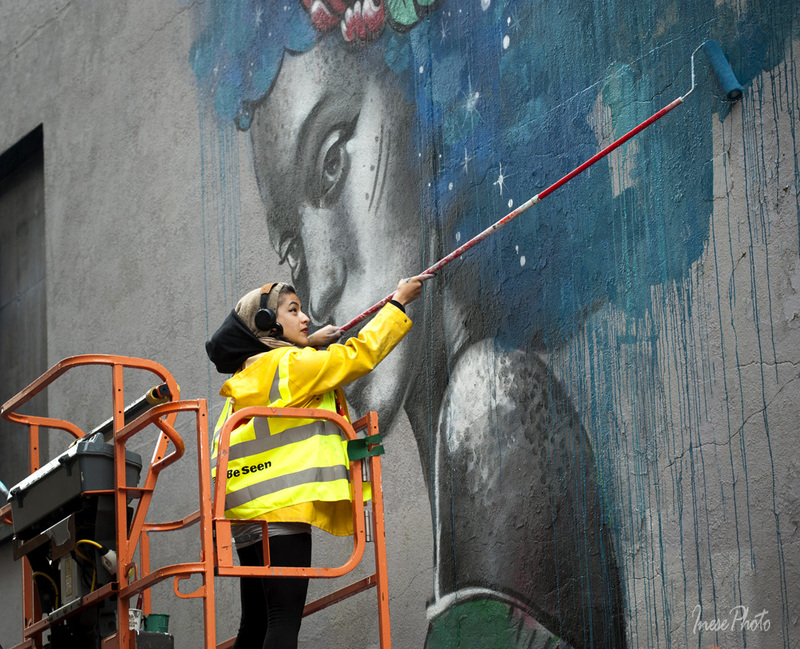 Her previous marriage-equality themed work was vandalised in 2015. 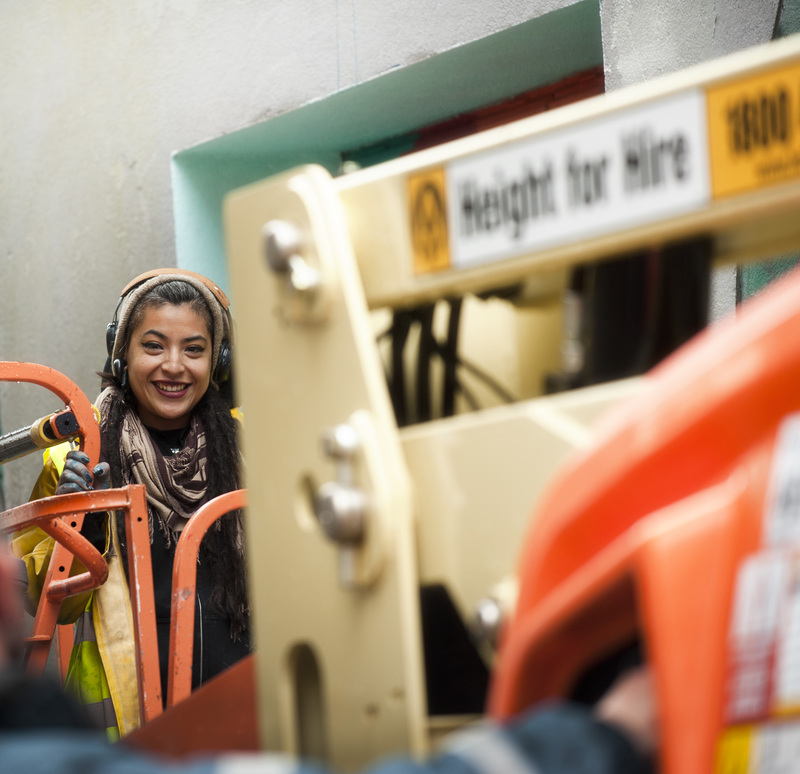 Charming Kathrina Rupit – KINMX – from Mexico lives in Dublin. 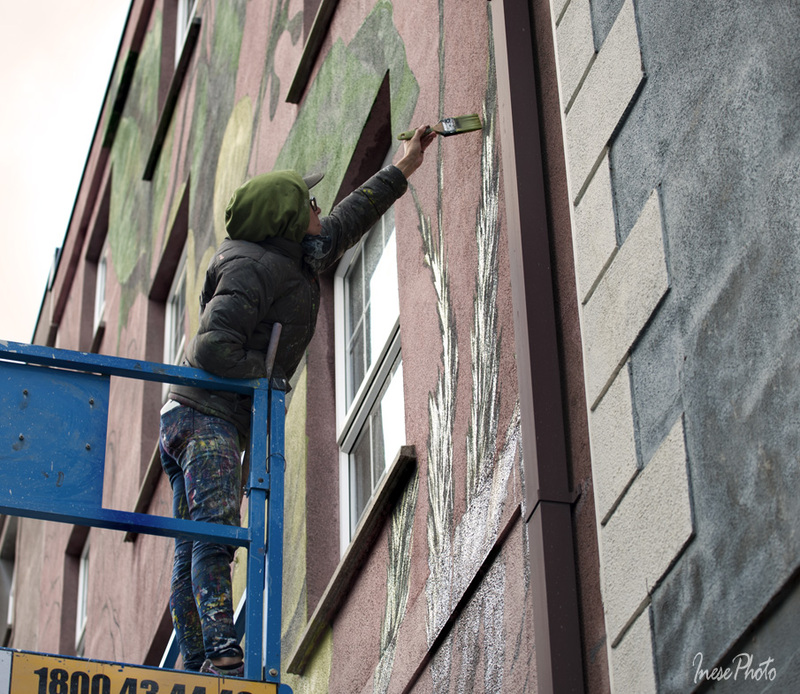 It is her second Waterford Walls festival. Her smile is as beautiful as is her mural. Sadly, the map in my copy of the festival brochure doesn’t exactly help me locate some artists. Hope I will come across their work by accident some day 🙂 Like it happened with this work of Joe Caslin. 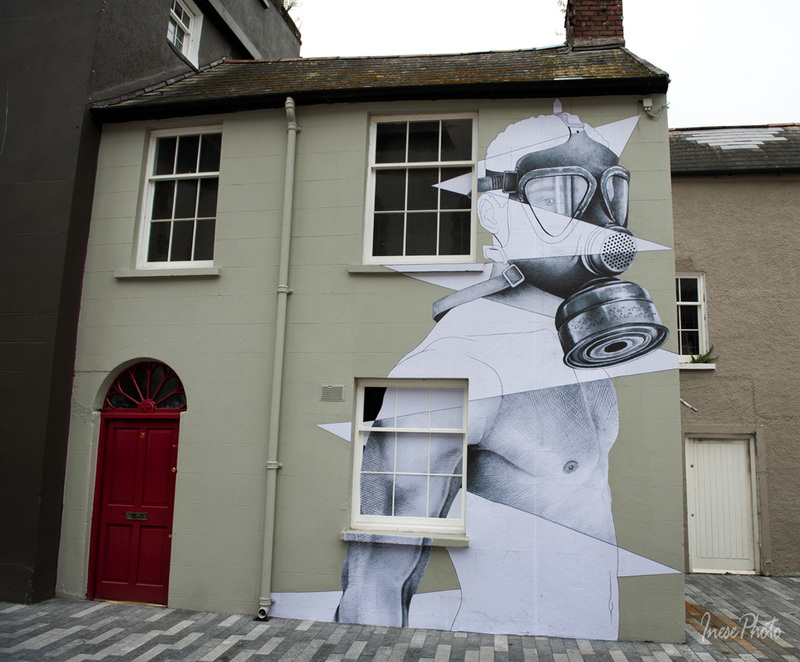 Thank you for your interest in Waterford Walls festival. The Harvest Festival is on the way. 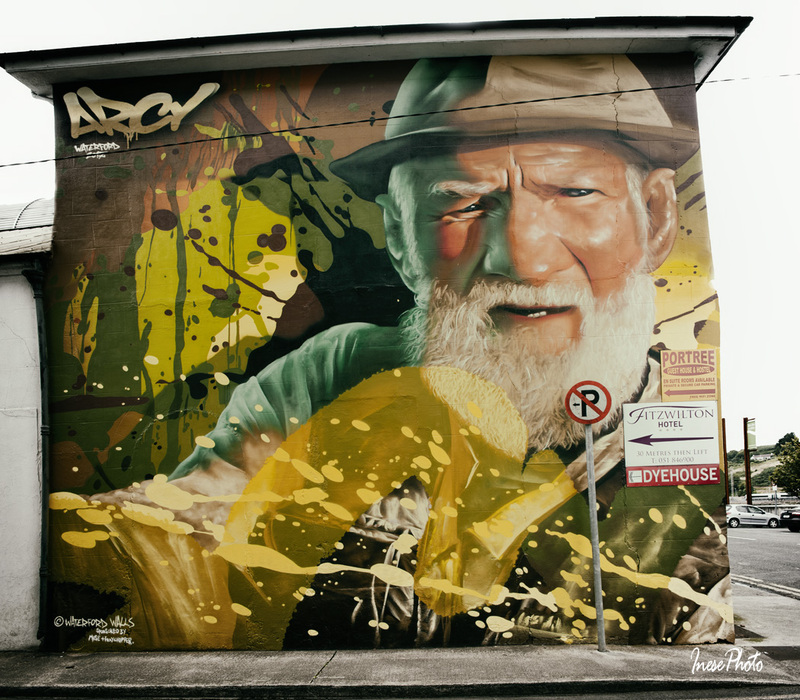 You might love to visit Graffiti Lux and Murals blog by Resa McConaghy from Toronto Canada and enjoy the ephemeral art of murals. Ah Robin, Kelsey’s Ostriches are no more! Just a couple of days ago I was walking by – the building has been painted over in egg yolk yellow. Robin, it might be that I haven’t seen it. I was not online for a while this summer. Well, I just found some, but there is no mountain climber. No problem or worries, Inese. I actually go around and say I’m sorry often since I run behind and try to catch up. Thank you for trying and maybe I will put a link sometime to them. They’re not his own thoughts, just the brewer’s. . . Your brother does a great job. Love the detail. This is the sad problem with murals! Many people think it’s no big deal to divide them or even destroy them! How could anyone think an egg yolk yellow wall is better than a gorgeous mural??!! By the way, is Waterford Falls the same place they make Waterford Crystal? Art is impressive in any way it is presented! Thank you Imelda! 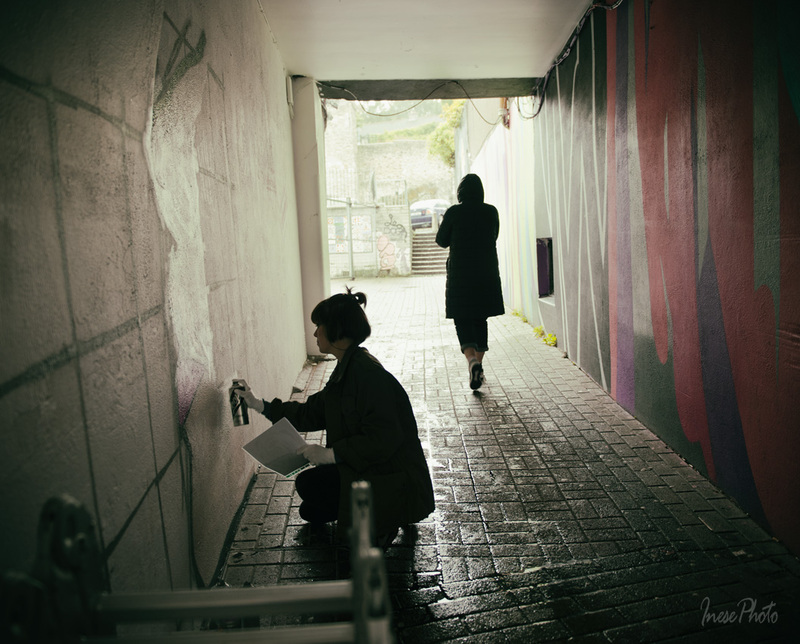 That tiny girl did a fantastic job, painting in the rain every day. Thanks, Inese! I love murals although I’d never heard of such a festival. In my case, it tends to be chance encounters and they are magical. Thanks very much! Thank you Olga! I think it is a wonderful idea to host and sponsor the muralists. They did such a great job for our city. Great post, Inese. These artists are so talented, each one with a distinctive style. Although I really like them all, I especially like Dan Leo’s with the creative wildlife, bold colors, and cheerful images. Thank you so much, Jet! Dan Leo is one of my favorites too 🙂 I am always delighted to see an animal or a bird, and his manner of painting is very creative. There are a lot of great murals there. I wonder, are the artists paid for these works, or do they do it for the exposure and the joy of it? Dave, I don’t know, may be some were paid, may be not, but I know for sure that most of them were sponsored by the local businesses. It was great to see some of the artists too. Hugs. Cheers to the colorful lady with the black hair. I am amazed at how talented these people all are and wonder how in the world they can paint in such large scale and have it look so good. I can’t imagine standing on a ladder with a paint roller and getting anything recognizable! Absolutely incredible work! Thanks for sharing Inese. Thank you for your comment! Yes, it is amazing. Huge talents. Thank you! 🙂 They are so very inspiring. If there ever needs to be a post showing the absolute importance of ART in society and how it raises levels of happiness, this is such a post. 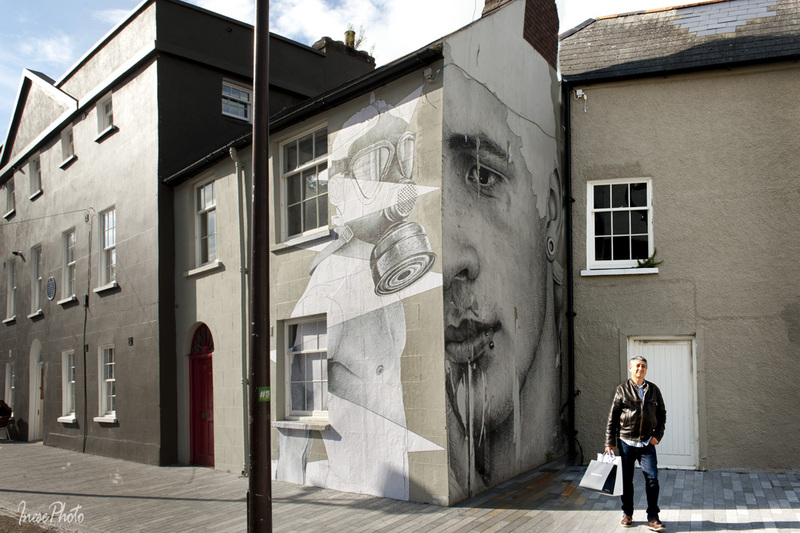 Art brings out the creativity in the people who see and admire the talent/expression of the artists ~ and with this post Inese, I can see just how important it is to support (and admire) the pieces of work like the Waterford Walls. Beautiful. Wishing you a wonderful weekend! Thank you so much for your kind words, Dalo. Art brings out the best in people, and does raise levels of their happiness 🙂 There are very little people who wouldn’t appreciate beauty and talent. A wonderful post, Inese! 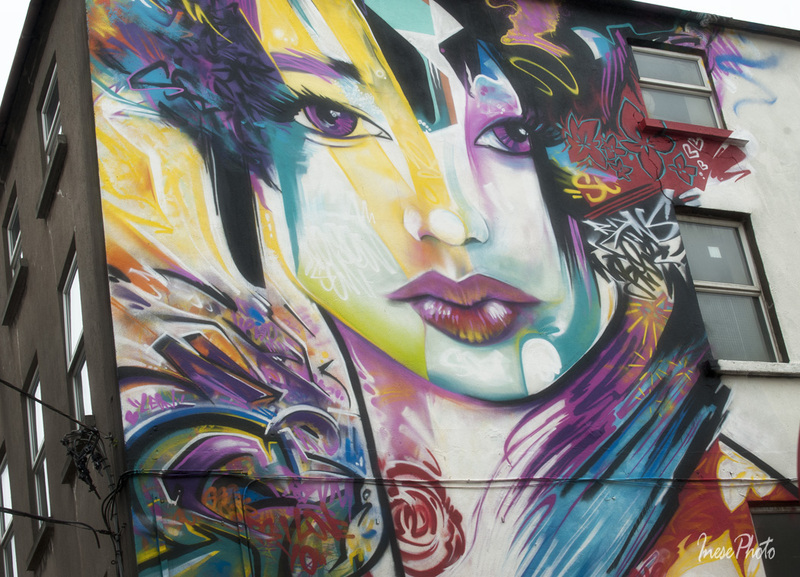 I hate to pick faves, but I adore the floral building by Lula Goce, and the beautiful face by Dermot McConaghy (& I’m not just saying that because we have the same last name) LOL! Also, thank you so much for the shout out! Yes Resa, I noticed the surname and thought of you 🙂 No relations? Poor Lula was working in the rain every day. Some artists left their works unfinished, but not Lula. I just noticed that I forgot to post her picture… I will add it. I think your blog is so full of lovely images, I could spend hours reviewing the older posts, scenery and beauty. . . Incredible detail on some of those, especially that orange bird. Yes, the bird is my favorite too. I wouldn’t mind more of those around. Thank you Derrick. It was fascinating to watch them work. These are fabulous. I particularly like the ostriches and the pink building covered in pink flowers. What a great idea for a festival. Oh, these are great! Do they get removed after the event? Some of them will stay until they weather away. Some walls will be repainted by another artist next year. We have some works that still look very good after 2 years ( our festival is only three years old). What a cool event! Thanks for sharing it with us. That’s so much creative talent all in one place. It’s almost impossible to pick out a favourite. Maybe the very last one, but only just. They’re all exceptional. Yes, they are wonderful 🙂 Blessed are those gifted to create art. I am amazed and a bit envious! All that talent! Yes, breathtaking. And it is happening just in front of your eyes. 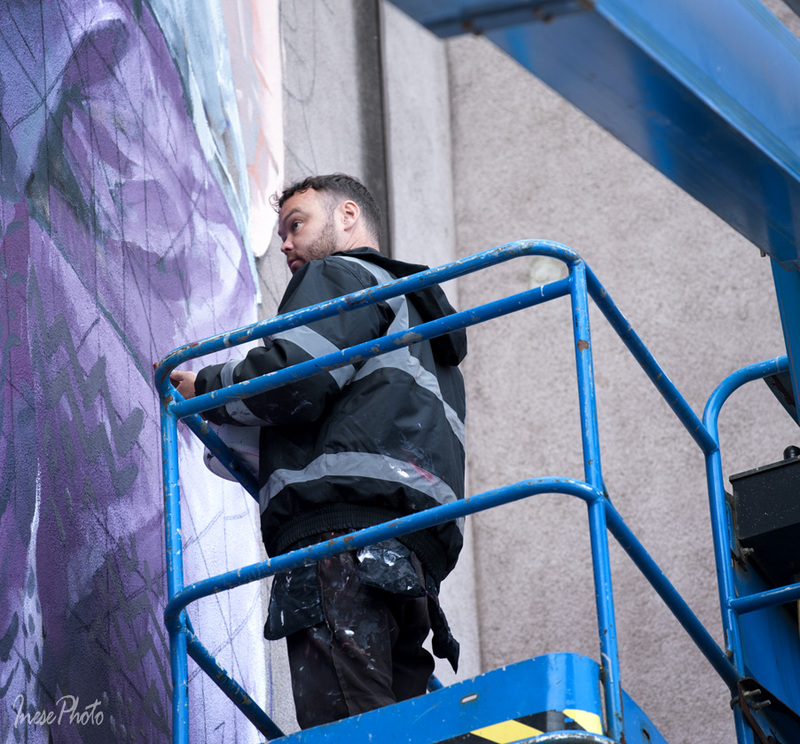 Being able to watch an artist create is another wonderful thing about this festival. Might need to put that on my list of things I need to do before I die. I am astounded by the genius and perseverance of those artists. 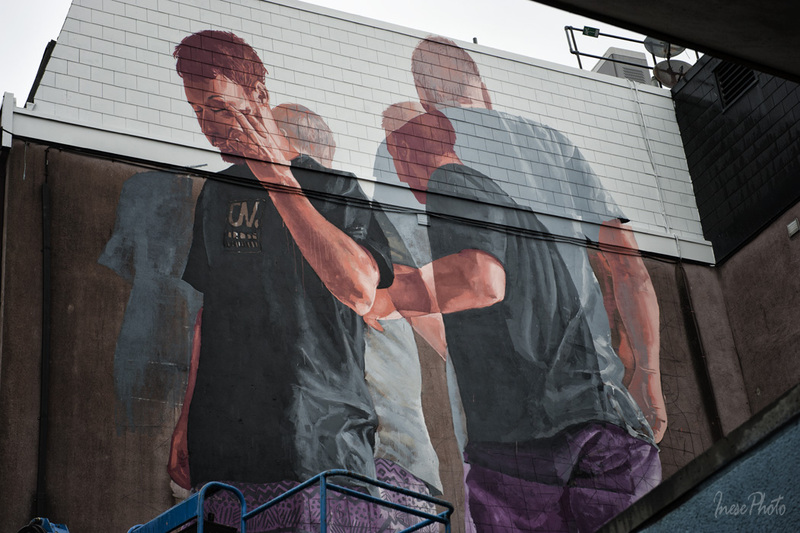 Each of those murals is capable of consuming the watcher for minutes. The rain was a big nuisance, but the watchers did walk from site to site and admired the creation 🙂 Some artists have gifted us with more than one of their works. 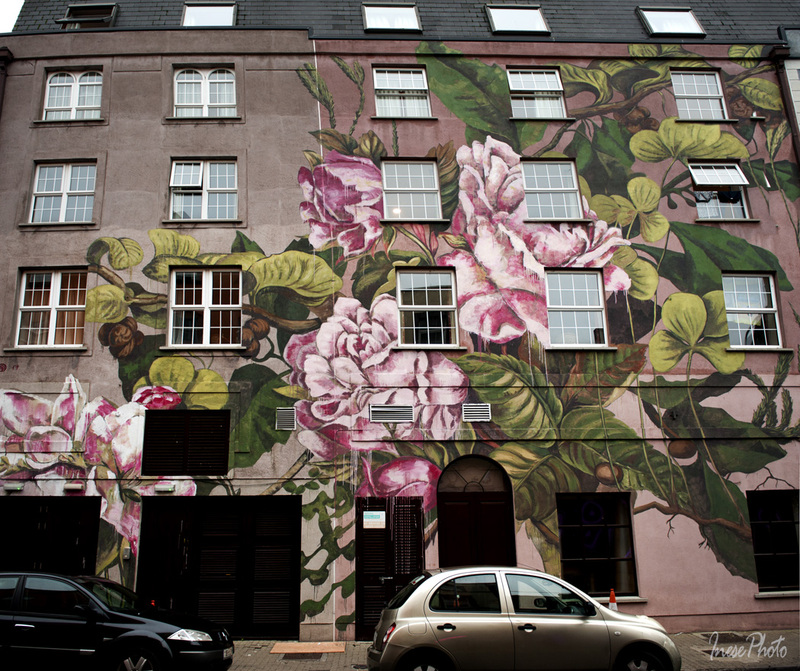 I wonder what drives these artists, especially in view of the heartbreaking impermanence of murals? Another wonderful selection of artworks – thank you so much! Wow. So beautiful! I kept finding a favorite and then finding another favorite. 🙂 Wonderful post, Inese. This is even better than the previous one. I do like them all. These artists have different styles and unique. Seeing some of the artists in action, they have so good sense of scaling what they painted in a much much larger than field of view of his/her eyes. Amazing. Such a cool thing for the city to do. It is amazing how people can be creative with paints. I don’t know why but I really liked the Ostriches running.